Dominik Antonowicz and Marek Kwiek authored and co-authored three chapters in a book forthcoming from Oxford University Press and edited by Brendan Cantwell, Simon Marginson, and Anna Smolentseva: High Participation Systems of Higher Education. Oxford (2018). Link here. The chapters result from a research project coordinated by Simon Marginson (University College London Institute of Education), started in 2014, with colleagues from seven institutions. Marek Kwiek, “Building a new society and economy: high participation higher education in Poland” (1-23). Brendan Cantwell, Romulo Pinheiro, and Marek Kwiek, “Governance” (1-26). Dominik Antonowicz, Brendan Cantwell, Isak Froumin, Glen A. Jones, Simon Marginson and Rómulo Pinheiro, “Horizontal diversity” (1-20). Higher Education has become a central institution of society, building individual knowledge, skills, agency, and relational social networks at unprecedented depth and scale. Within a generation there has been an extraordinary global expansion of Higher Education, in every region in all but the poorest countries, outstripping economic growth and deriving primarily from familial aspirations for betterment. 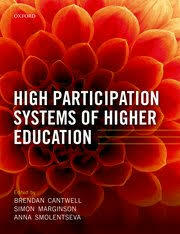 By focusing on the systems and countries that have already achieved near universal participation, High Participation Systems of Higher Education explores this remarkable transformation. The world enrolment ratio, now rising by 10 per cent every decade, is approaching 40 per cent, mostly in degree-granting institutions, including three quarters of young people in North America and Europe. Higher Education systems in the one in three countries that enrol more than 50 per cent are here classified as ‘high participation systems’. Part I of the book measures, maps, and explains the growth of participation, and the implications for society and Higher Education itself. Drawing on a wide range of literature and data, the chapters theorize the changes in governance, institutional diversity, and stratification in Higher Education systems, and the subsequent effects in educational and social equity. The theoretical propositions regarding high-participation Higher Education developed in these chapters are then tested in the country case studies in Part II, presenting a comprehensive enquiry into the nature of the emerging ‘high participation society’.